As you transition from resort skiing to the backcountry, your set-up inevitably will become more complex. Some AT bindings prioritize downhill performance, particularly for aggressive skiers, while others focus on efficient uphill travel by keeping weight low and a natural stride in tour mode. To add to the mix, a growing number of hybrid newcomers strike an impressive middle ground, blurring category lines. How do you navigate the complex world of binding jargon, weight comparisons, and confusing product descriptions? We’ve got you covered. Below we break down the pros and cons of the three main categories of backcountry bindings: tech, frame, and hybrid. For our top picks for the 2018-2019 season, see our article on the best ski bindings. For many years, tech bindings have been the go-to design for backcountry enthusiasts. A tech binding has four metal prongs (two at the toe and two at the heel) that insert into metal holes and slats on backcountry boots. To transition into walk mode, the heel of a tech binding rotates so that the toe can stay attached while the heel of the boot remains free to allow for a natural gait as you travel uphill. In general, tech bindings are relatively light and easy to use, making transitions from ski to walk mode quick and seamless. One of the great benefits of a tech binding is its low weight. Let’s take, for example, the G3 Ion 12, which weigh 2 pounds 9 ounces per pair. 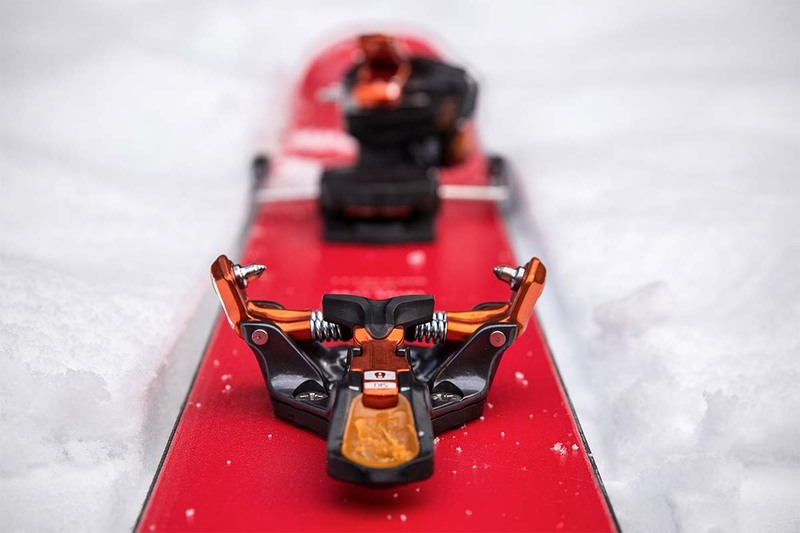 Compare that to the lightest AT frame model on our list of the best ski bindings, the Marker Tour F12 EPF at 4 pounds 12 ounces, and it’s clear why uphill-focused touring fans love tech bindings. For ski mountaineers, tech bindings can get even more lightweight—some forego brakes in order to shave critical ounces. The Dynafit TLT Speed, for instance, weighs a feathery 1 pound 4.7 ounces. Walking up snowy slopes for hours on end can feel like a relative breeze after switching to one of these ultralight models. 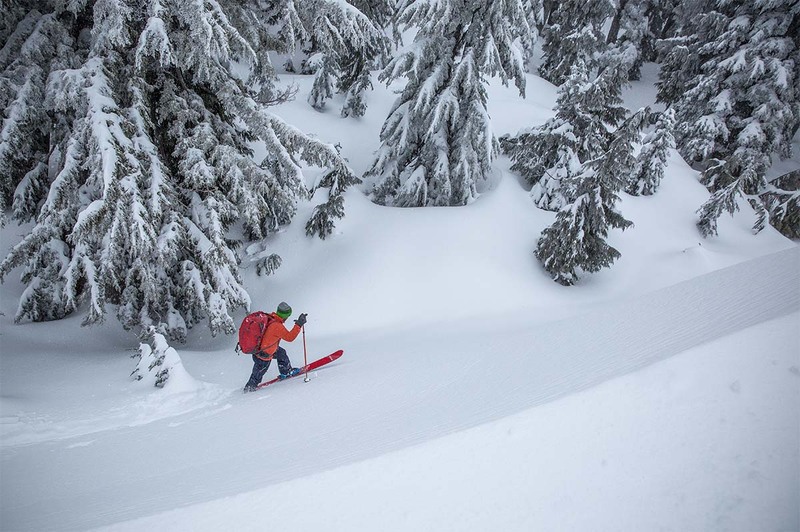 Companies like Dynafit, G3, Salomon, and a few others have designed tech bindings that prioritize easy and fast transitions. Most experienced backcountry skiers are able to change from walk to ski mode and click in, ready to ride, without ever stepping out of their bindings. This whole process can take as little as 10 seconds, and all it requires is a rotation of the binding heel. While standing on an exposed ridgeline with howling winds, the speed at which you’re able to switch to ski mode and start descending really makes a difference in overall comfort and morale. For ski mountaineers attempting long traverses, these saved seconds quickly add up, resulting in more mileage per day. A frame binding, on the other hand, can be a bit slower to transition, which often leaves a tech binding user waiting in the cold for his or her friend to complete the process. The low weight and smooth walkability of tech bindings does come with sacrifices, and most notably on the downhill. With only four small metal pins keeping each boot attached to the binding, smaller forces can more easily cause these bindings to release prematurely. In fact, many skiers have experienced popping out of their tech bindings while skiing groomers at the resort or navigating choppy snow. To combat this, some people will pull the small toe tab into the “lock” position (do so at your own risk), which keeps the boot toe securely locked with little elasticity for releasing. Unfortunately, this elasticity is what allows a binding to release when needed, like when a skier falls or twists a knee. Another drawback with tech bindings is reduced security. To better illustrate this point, “DIN” is a certification given to frame bindings and some tech bindings that describes their releasability. Alpine and frame AT bindings are certified ISO9462:2014, which guarantees a safer binding and release. Tech bindings (but not all tech bindings) have their own DIN certification, which is recognized as ISO13992:2007. Finding a tech binding with DIN values inspires a bit more confidence, but the certification is not the same as the system used for frame or alpine bindings. All of this said, tech bindings are great for skiing less aggressively in soft snow, which is how most of us ski in the backcountry anyway. While carving on groomers, going off of jumps, or skiing variable snow at speed, it’s often worth opting for a frame-style binding. 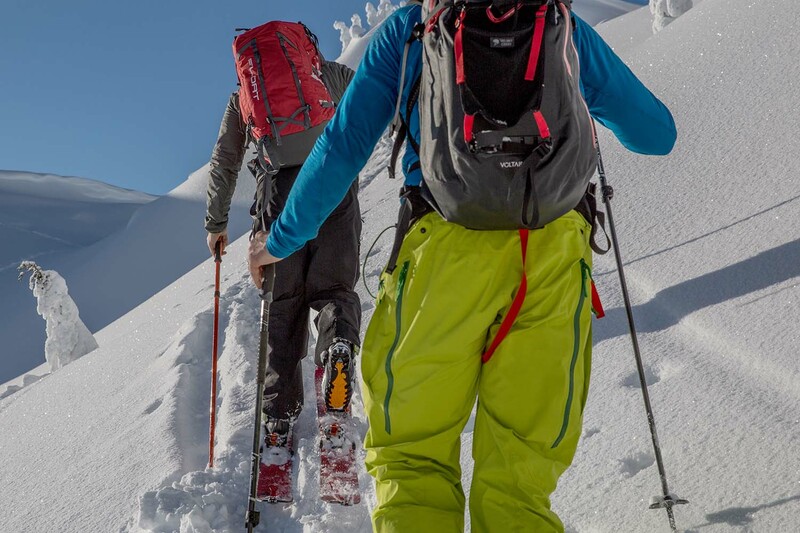 If you decide that tech is the style for you, it’s worth planning ahead and purchasing a pair of backcountry ski boots that will be compatible with the pin toe and heel. Classic alpine ski boots will not work with a tech binding since they are not manufactured with the metal holes and slats needed for the pins to lock in place. And because a backcountry-specific boot may or may not work with a frame binding, having one pair of boots for all of your skiing endeavors often becomes a complicated pursuit. With more skiers spending equal amounts of time on and off-piste, manufacturers are now designing boots that can work with both tech and frame bindings. This is a very complicated topic, and we recommend contacting the binding manufacturer or chatting with your local gear shop staff to double-check compatibility before making a purchase. The good news is that any pair of boots labeled as “alpine touring” will work with tech bindings, no matter who makes them. As long as you’re committed to putting together a backcountry-specific set-up, your job should be easy. AT frame bindings are a crossover category that aims to take the best attributes from both alpine and backcountry offerings. A frame binding like the Salomon Guardian looks almost identical to the alpine bindings you’ve always used at the resort. What are the differences? 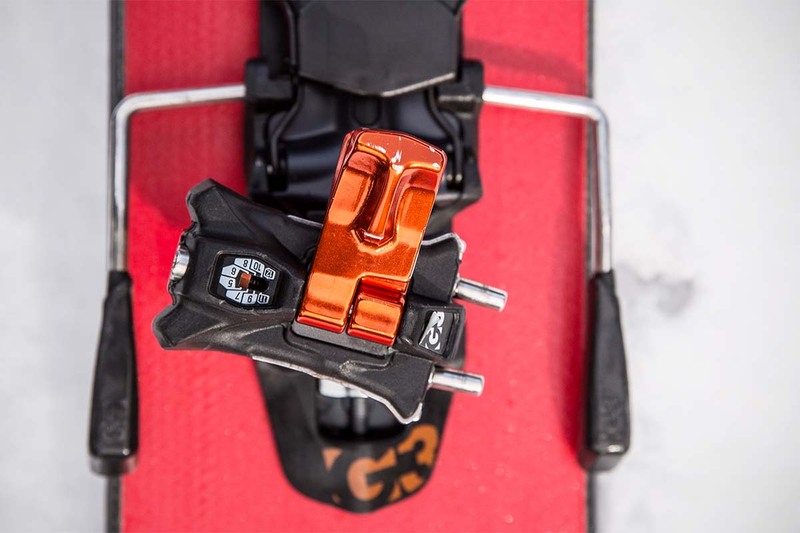 A frame binding has the ability to release at the heel from the rails mounted to the ski, allowing a backcountry skier to walk on flat sections and up hills comfortably. As opposed to a tech binding, your boots stay locked into the bindings in walk mode, but the entire binding pivots at the toe. Many newbie backcountry skiers will use a pair of frame AT bindings as their first touring set-up—this style is so similar to the alpine bindings that they are used to. However, when you go for your first full-day ski tour, you will start to understand the allure of tech bindings. The added weight of frame bindings takes its toll after any substantial amount of time spent on skin track. Additionally, because a frame binding stays attached to your boot while you walk, the motion can feel quite clunky and not nearly as natural as using a tech binding. Finally, there is less play and flexibility in the ski since the binding is mounted with a stiff rail, which can make walking feel quite strenuous. Overall, a frame binding is a good option for those who prioritize downhill shredding and plan to spend more days at the resort than in the backcountry. However, weight is the price you pay for the dual functionality, and as a result, we don’t recommend them for longer tours. For covering ground in the backcountry and long ascents, frame bindings pale in comparison to the weight and smoothness of tech bindings. Since frame bindings essentially are alpine bindings that allow you to tour uphill, they are fairly simple to use. A plate under your foot, parallel to the ski, holds the toe and heel piece together while allowing the heel to pivot so you can travel up the skin track. 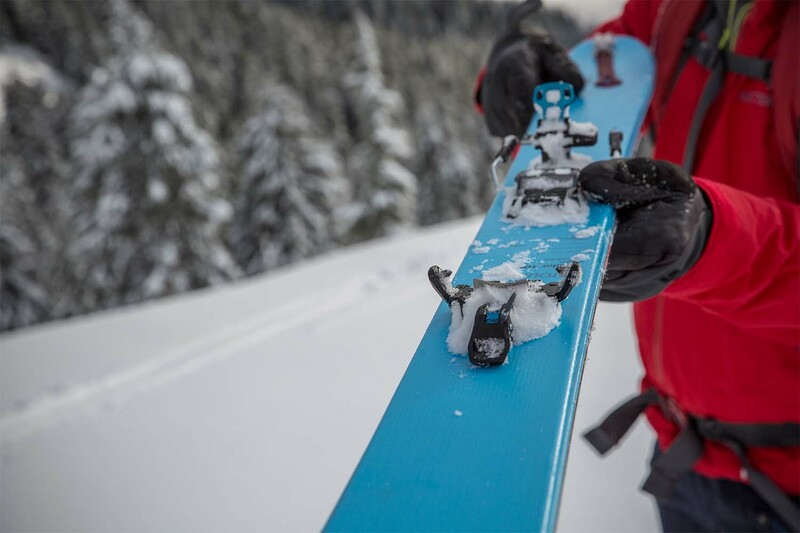 When you’re ready to ski down, you pull a lever mid-binding that locks the frame into place on the ski, allowing it to perform exactly like an alpine binding. As mentioned above, frame bindings tend to be slightly slower to transition compared to tech bindings. Like an alpine binding, most frame AT bindings are certified with the standard alpine DIN, allowing a skier to lower or raise the release value depending on experience level and body weight. This makes for a much safer descent. On a similar note, because of the beefy structure of this type of binding, you are much less likely to pre-release than you would while using a tech binding. All of this means that a frame binding will release when you need it to (when you take a fall) and should stay locked and secure when you really want it to, even while skiing aggressively. 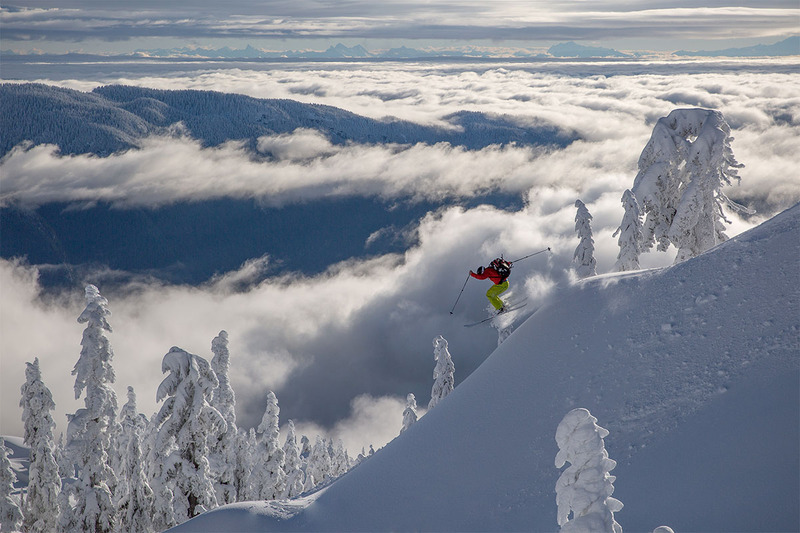 For this reason, skiers who want one set-up for the resort and the backcountry often lean towards a frame binding for its security in ski mode and its ability to switch into tour mode. Another advantage of frame bindings is that they can accommodate a wide range of ski boots. Most alpine touring bindings are able to handle either standard downhill boots or touring boots that have rockered soles. But that doesn’t mean you can take any old boot out and convert your set-up from alpine to AT with a simple binding swap. You still need the added mobility and range of motion of a boot that’s been designed for backcountry use. That said, you can wear your old resort boots for days spent inbounds, but use a compatible backcountry ski boot for sidecountry play. 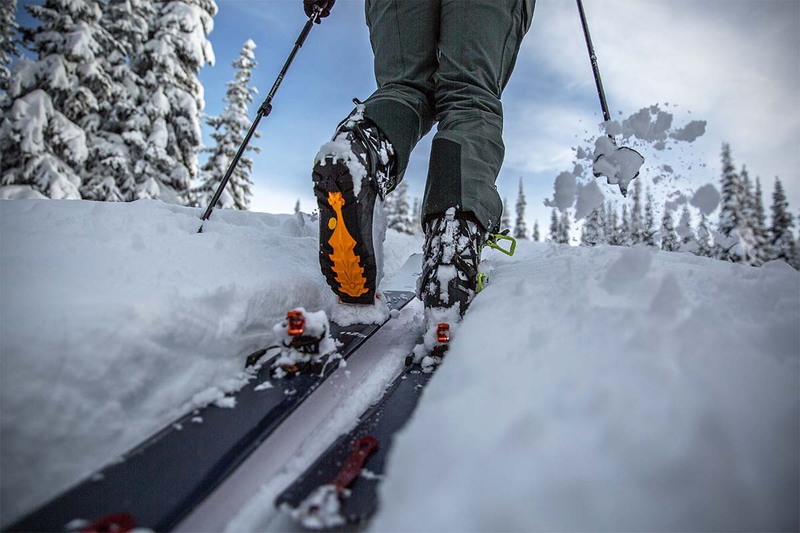 Not all backcountry-specific boots will work with frame bindings (boots with MNC or WTR ratings are a safe bet), so again, it is worth double-checking with the boot manufacturer. New Hybrid Bindings: The Best of Both Worlds? 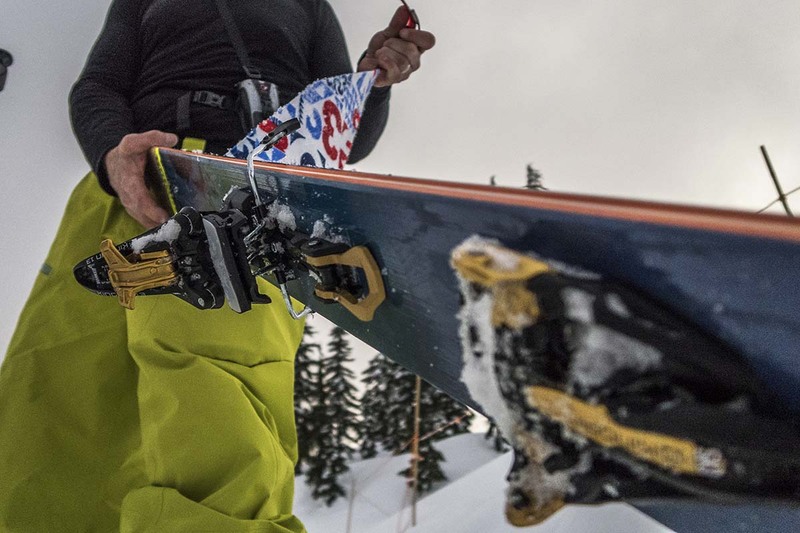 Big mountain skiers wanting a binding that allows for aggressive skiing while maintaining the low weight of a tech binding may have thought that there was no solution... until now. Companies like Marker and Fritschi recently developed a new type of hybrid binding with a pin toe and frame heel. The pin toe allows for the same walkability that a tech binding offers, while the frame heel keeps your ski boot locked in more effectively. For the 2018-2019 season, Salomon went a step further by releasing the new S/Lab Shift MNC, which is the first tech binding that provides legitimate performance and safety while bombing laps at the resort. The key ingredient is the toe piece, which functions like other pin-ready set-ups for uphill travel but converts into a traditional downhill toe design once you’re in ski mode. This gives the Shift impressive versatility: you can wear your downhill boots and put down the power in hardpack and crud, or go lightweight with your touring set-up on backcountry adventures. We look forward to putting the Shift through more testing and will post an in-depth review when we do. A pair of hybrid bindings cuts significant weight compared to frame bindings. The heaviest model in our bindings round-up is the Salomon S/Lab Shift MNC at 3 pounds 13 ounces per pair. Comparatively, the lightest AT frame binding, the Marker Tour F12 EPF, is nearly a full pound heavier. With the drop in weight from a frame binding but more stability, security, and better downhill performance than a tech binding, these hybrids could be the perfect compromise. That said, there still is no binding on the market lighter than a true tech binding. Despite all the hype, the Salomon Shift still weighs a pound more than our heaviest tech binding thanks to its two-mode toe piece and beefy heel. If saving weight for long, intense days of uphill slog in the mountains is the goal, there still is nothing that beats a classic tech binding. One of our favorite benefits of these new hybrid bindings is the security we feel on the descent. With a frame binding, similar to our alpine set-up, we have a bit more confidence that they will keep us locked in when we take a fall or charge over rough, bumpy terrain. For downhill-focused skiers looking for more stability and power and who don’t mind the added weight, a hybrid makes a great choice. 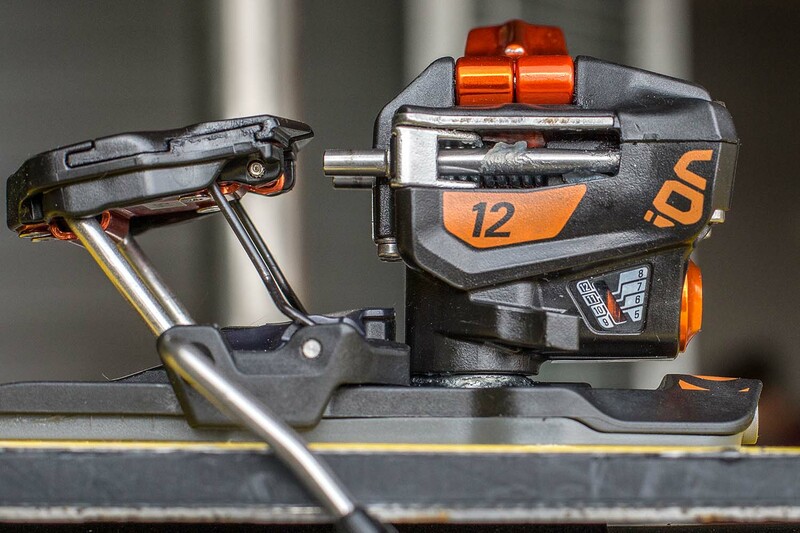 However, in terms of releasability, bindings like the Marker Kingpin 13 and the Fritschi Tecton 12 only have the tech DIN certification, a standard that doesn’t quite come close to that of a frame DIN. With this in mind, we feel slightly hesitant to use these as aggressively as frame bindings. The Salomon S/Lab Shift MNC, however, is the only tech/hybrid binding on the market currently certified with the alpine DIN. This is an incredible step in the world of safe and secure tech bindings, and one of the reasons it tops our list this season as our favorite backcountry option. 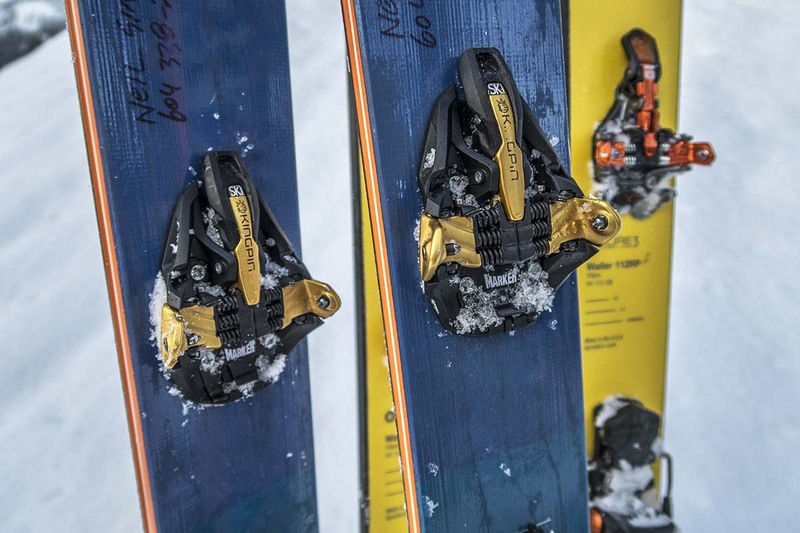 Unfortunately, not all hybrid bindings are created equally in terms of boot compatibility, which can be challenging when choosing the right boots for your specific bindings. Any boot used with a “pin toe, frame heel” binding must be a touring-specific model (alpine boots do not have the metal holes at the toe for the pins to latch into). 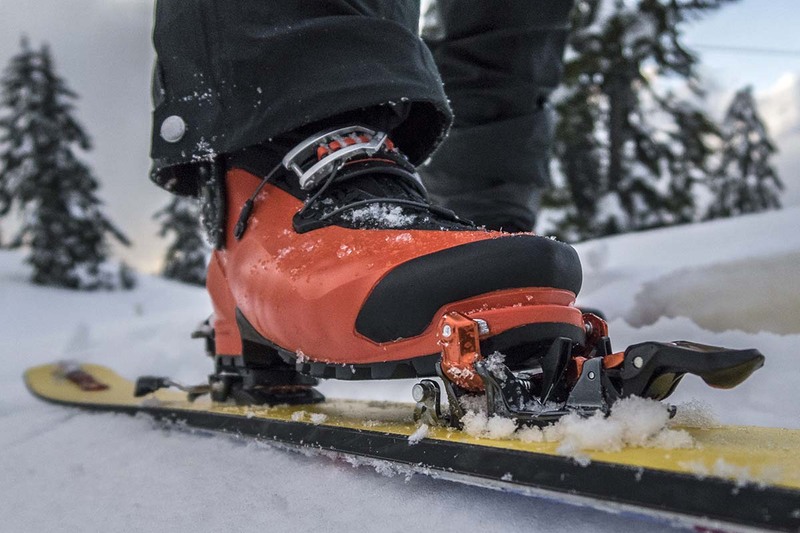 In terms of the boots we mentioned above, the Fritschi Tecton 12 will work with most AT boots, but not all (Fritschi has published a list of boots that will work with this binding.) Similarly, the Salomon S/Lab Shift MNC will work with most boot sole types, provided they have full heel and toe lugs, but we recommend doing extra research on the boot you’re eyeing just to confirm. AT binding technology has improved dramatically over the last few years, and no matter which style you choose, you can tour to places where crowds are virtually non-existent and snow is untouched. Before settling on a binding, it’s important to take into consideration what type of skier you are, how you like to travel in the mountains, and your ski objectives. 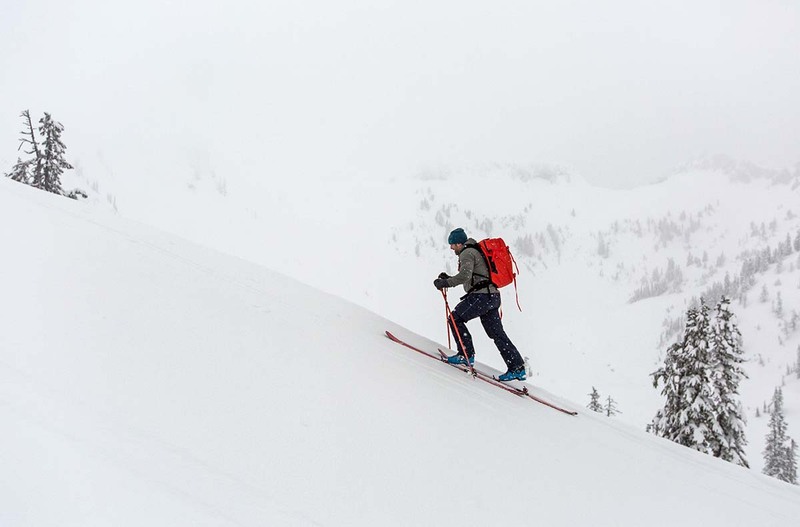 Many seasoned backcountry skiers decide that the ability to go fast and light through the mountains with less weight on each foot is a high priority. 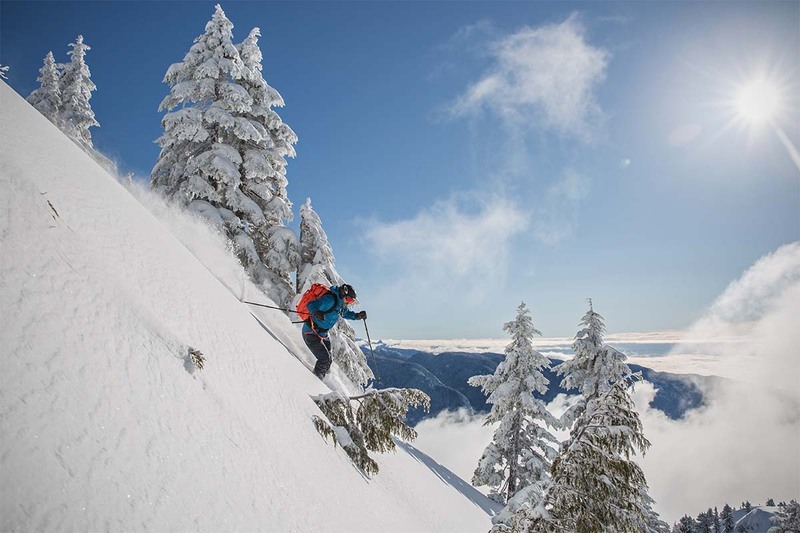 For example, some ski destinations, such as the Tetons in Wyoming or the Valhallas in British Columbia, have long, steep approaches before reaching the highly sought-after terrain. A lighter pair of bindings will help you maintain energy in these mountains and afford you more laps. And in soft snow or mellow sections, a tech binding’s downhill performance is ample. However, for hard-chargers who like to push the boundaries with speed, steeps, and big drops, a tech binding may not have the desired security. 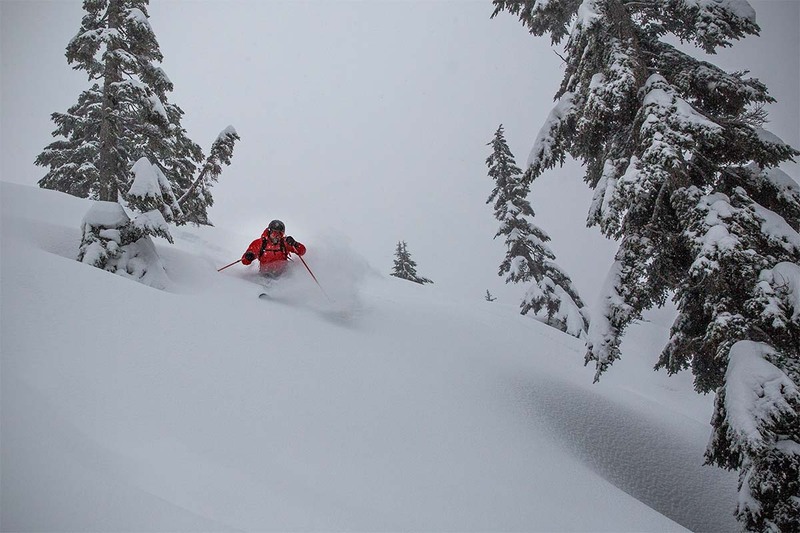 For these reasons, a tech binding is most at home in the backcountry, away from the varied conditions and higher speeds of the resort. Some skiers are not ready to give up their season pass and love the ease of chairlift access, while occasionally opting for a human-powered day in the backcountry. If this sounds like you, a frame binding might be your best bet. This binding style can handle hardpack, chunder, big jumps at the park, powder, and everything in between, while still offering the ability to tour up a skin track. Frame bindings also are the cheapest of the touring options, which always is nice. That said, the weight and clunky feel of frame bindings make longer days in the backcountry tiresome, and you may end up being jealous of your ski partner who opted for tech bindings. Not quite as light as a true tech binding, new hybrid models still are pounds lighter than the average AT frame binding. And perhaps more importantly, they offer a downhill feel with greater holding power that is closer to that of a frame binding. 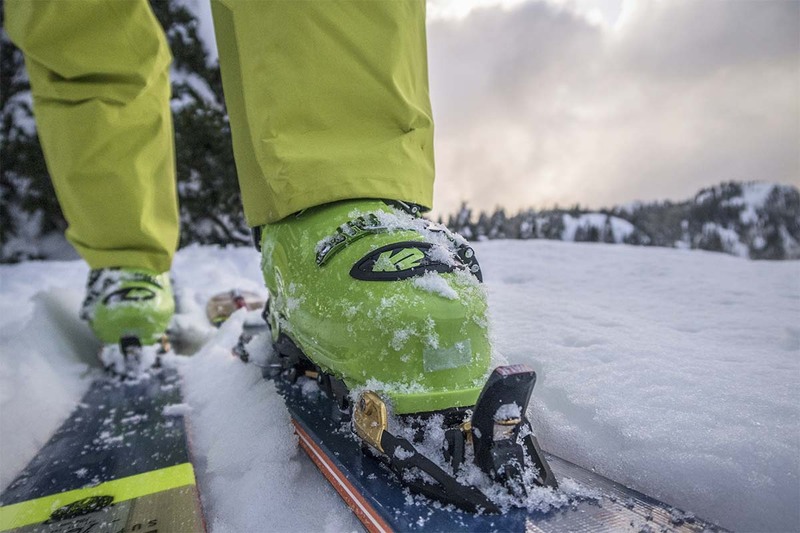 For the 2018-2019 season, the Salomon S/Lab Shift MNC is the newest AT binding technology and is disrupting the market in a big way. We look forward to a full season of testing to see if they stand up to the rigors of the backcountry.